Great white sharks may prove unlikely saviours of human lives thanks to their huge and extraordinary genome, scientists have discovered. The first “map” of the creature’s DNA has uncovered a plethora of mutations that protect against cancer and other age-related diseases, as well as enhanced wound healing. Experts believe understanding more about the way the great white has evolved to keep its genome stable and resist disease could lead to new life-preserving human treatments. Study co-leader Dr Mahmood Shivji, director of the Save Our Seas Foundation Shark Research Centre at Nova Southeastern University in Florida, US, said: “Genome instability is a very important issue in many serious human diseases. “Now we find that nature has developed clever strategies to maintain the stability of genomes in these large-bodied, long-lived sharks. Cracking the great white genetic code also revealed the large size of the apex predator’s genome. It contains an estimated 4.63 billion “base pairs”, the chemical units of DNA, making it one-and-a-half times bigger than its human counterpart. Buried within the great white’s DNA are around 24,500 protein-encoding genes, compared with 19,000 to 20,000 in the average human. Great white sharks, which measure up to 20 feet long and weigh as much as three tonnes, are ancient giants that have been on Earth for at least 16 million years. Over time they have evolved numerous molecular changes in genes linked to DNA repair and damage tolerance, the scientists found. Together these adaptations have acted to keep the shark’s genome stable. In contrast, humans suffer high rates of genome instability caused by accumulated DNA damage, which accounts for their vulnerability to age-related diseases such as cancer. “Not only were there a surprisingly high number of genome stability genes that contained these adaptive changes, but there was also an enrichment of several of these genes, highlighting the importance of this genetic fine-tuning in the white shark,” said Dr Shivji. At the same time the great white genome contained high numbers of so-called “jumping genes”, or transposons – short DNA sequences that leap from one location in the genome to another and help speed up evolution. 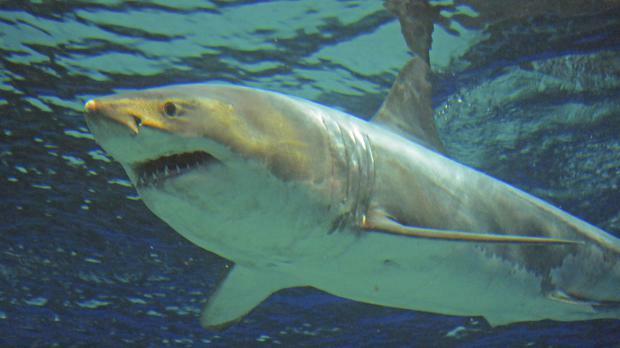 Other great white gene mutations were found to be linked to processes involved wound healing, including blood clotting. Sharks are known for their impressive ability to recover from even serious injuries.